Just like "technically correct" is the best kind of correct, "technically possible" is the best kind of possible. Specifically, it's technically possible to slot a Hellcat crate motor into the Jeep Wrangler and Gladiator, as confirmed by Jeep brand chief Tim Kuniskis. Speaking to Australian media last week, Kuniskis went on to say that "everybody" keeps asking him if the supercharged, 6.2-liter Hellcat V8 fits in the Wrangler and Gladiator, and that the answer is yes. "It fits like a glove," said Kuniskis. But – there is a but – the fitment is so close for comfort, it makes the combination one that Jeep can never produce. "There's no air space around the engine [...] so you have no crush space, you have nothing that can be used to absorb energy in a crash. It's not a problem to put it in – other than emissions and fuel economy – except it would never pass any crash tests, and that's a problem," as Kuniskis told Drive. 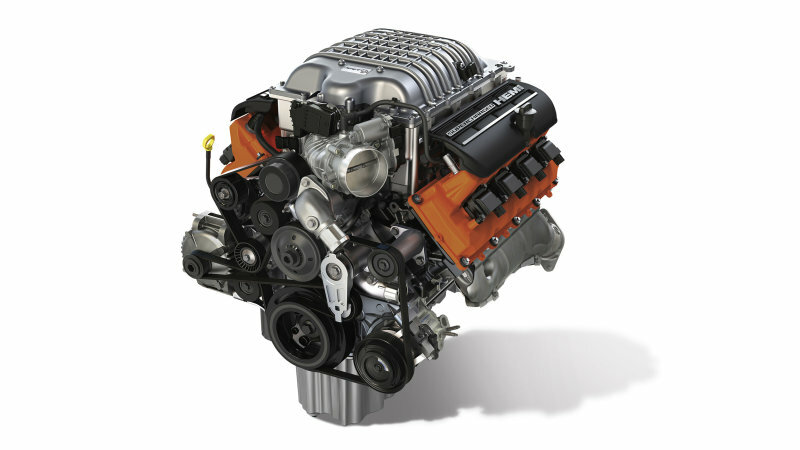 However, since the Hellcat is now out of the bag, it's probably only a matter of time until hobbyists with access to these engines will start putting them into Wranglers and Gladiators. And with the time-honored piece of advice – just don't crash into anything – it'd be a combination worth seeing and hearing. Just to throw it out there, a "Hellcrate" engine costs less than $20,000 new. Kuniskis also said that Jeep is "gauging interest" for the J6 concept, one of the Easter Jeep Safari concepts that were just revealed. "[The J6] is just a concept at this stage. But that doesn't mean we're not going to gauge interest for it." However, he said justifying its production is apparently "tough."